Thursday 22 November 2018 was a night to remember at the Globe. 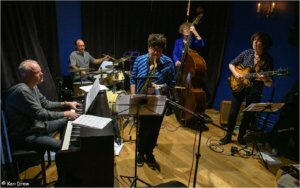 The audience in the crowded jazz bar was treated to an evening of beautiful original music from the Alison Rayner Quintet, which had just won the Jazz Ensemble of the Year award in the 2018 Parliamentary Jazz Awards. The gig was a joint promotion by Jazz North East and Jazz.Coop. We did not know that Alison Rayner Quintet was in the running for an award when the booking was made, but our canny programmers have an ear for high quality jazz. There was another Parliamentary Jazz Award winner in the Globe that night. 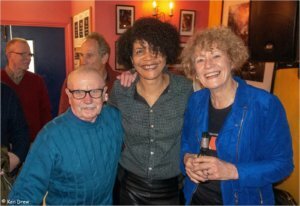 Jazz.Coop member Lance Liddle, founder of the jazz review blog Bebop Spoken Here had won the Jazz Media Award which had been presented to him by Newcastle central MP Chi Onwurah. The photo shows Lance, Chi and Alison reunited at the Globe on 22 November. Photos are copyright of Jazz.Coop member Ken Drew.